Researchers at Oxford University have shown that it is possible to identify genetic catalysts that accelerate the evolution of antibiotic resistance in bacteria—and that this knowledge could be used to design treatments to stifle the development of resistance. The study was funded by the Wellcome Trust and the European Research Council and is published in the journal Nature Ecology & Evolution. Senior author Professor Craig MacLean, from Oxford's Department of Zoology, said: "It is well established that different species of bacteria evolve resistance to antibiotics during infections at very different rates. One potential explanation for this observation is that some species of bacteria may be intrinsically better at evolving resistance to antibiotics than others." To test this hypothesis, the team challenged species of the genus Pseudomonas - bacteria that are opportunistic pathogens of humans, animals and plants—with the common antibiotic ceftazidime. 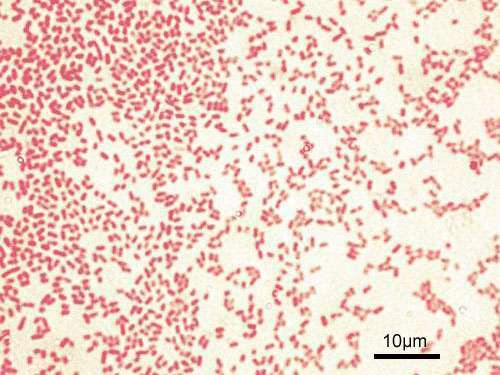 They found that individual species of Pseudomonas evolved antibiotic resistance at radically different rates. Professor MacLean said: "We identified that the presence of a gene known as ampR is a major cause of this variation. ampR is a master regulatory gene that switches the expression of hundreds of other genes on and off, including genes involved in antibiotic resistance. This gene acts as an evolutionary catalyst for antibiotic resistance. Put simply, species that carry the ampR gene evolve resistance at a higher rate than species that lack this gene. ampR has this effect because it makes it easier for random mutations to increase the expression of antibiotic resistance genes." The study marks the first time a range of bacteria species have been subject to controlled experiments in this way. Species studied by the researchers included Pseudomonas aeruginosa - an important human pathogen that can cause serious infections, particularly among people with cystic fibrosis or those already in hospital. Professor MacLean said: "Pseudomonas aeruginosa carries the ampR gene, and it evolved ceftazidime resistance at quite a high rate in our experiments. We therefore wondered if it would be possible in effect to remove the evolutionary advantage that this gene provides." The team treated cultures of the species with a combination of ceftazidime and avibactam, an enzyme inhibitor that blocks the activity of an important resistance gene that is controlled by ampR. In the lab, this strategy worked 'spectacularly well' according to the researchers, eliminating populations of Pseudomonas aeruginosa before they could evolve resistance. Inhibitors like avibactam are often used to treat infections caused by resistant strains of bacteria in clinical settings, but the team's findings suggest they could be used to prevent resistance developing in the first place. However, the researchers caution that follow-up in vivo experiments are required to help test the idea. Professor MacLean added: "This work has two important implications. First, our study shows how understanding the evolutionary biology of resistance can be used to come up with new ways to stop resistance from spreading. In this case, we show that using an enzyme inhibitor that blocks the evolutionary path to antibiotic resistance can be used to eliminate populations of an important pathogen without driving the spread of resistance. Second, this study shows that comparing how closely related species of bacteria become resistant to antibiotics can help us better understand resistance in pathogens. "Antibiotic resistance is a growing problem that threatens to fundamentally undermine our health and welfare. For example, the UK government's O"Neill report warns that antibiotic-resistant infections will surpass cancer as a source of human mortality in about 2050. Given this crisis, there is an urgent need to develop new ways of treating bacterial infections. The key idea that motivates our research is that we can use an understanding of how evolution works to come up with new ways of predicting and preventing the spread of resistance." The paper "Identifying and exploiting genes that potentiate the evolution of antibiotic resistance' is published in the journal Nature Ecology & Evolution.